In November I went back to Melbourne (my third visit for the year) to spend five glorious days eating and having fun. And also to turn 35. I traveled with my friend Ashleigh, and we had a marvelous time and ate a lot of food. 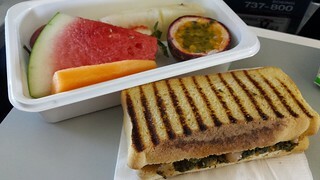 We flew with Qantas, that does have a meal service. I had ticked the vegan box, and Ashleigh had ticked the fruit plate box as she is vegan but also gluten free. 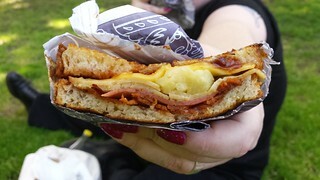 The vegan option ended up being a gluten free toasty, complete with vegan cheese, which was pretty nice. So we shared the toasted sandwich and the fruit plate. 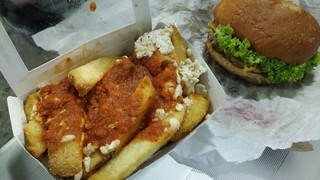 After the SkyBus dropped us off at Southern Cross station, our first stop was Lord of the Fries so Ashleigh could get some gleegan burger goodness. She got their chicken burger, made GF and vegan, and love it. I had a little bite, and the GF bun was actually not bad. Regular readers will know that I am frequently underwhelmed by LotF, though I do enjoy their French Canadian (aka Poutine) fries (as long as they manage to cook the chips right). I have several people recommend the Italian one to me, which is napoli sauce and cheese, so I thought I'd try that. Alas, underwhelmed again. And yet again the fries themselves were not great. Oh well. The important thing was that they did not fill me up too much, because it was Thursday night. 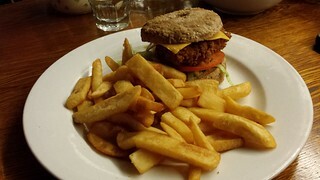 Thursday night in Melbourne means I go to The Cornish Arms for trivia and ridiculous vegan food. (Like really ridiculous... their current special is a mac and cheese burger where the mac and cheese is the bun! I have seen photos and know people who have had this.) We started with some gravy and cheese fries (delicious, I could drink the gravy) and some buffalo chicken (way too hot for me, I just had a nibble). A bit earlier in the year I was rewatching Gilmore Girls (preparing for the revival) and for Lorelai's 35th birthday Rory organised her a giant pizza. So the idea of celebrating my 35th birthday with a pizza part seemed appropriate. Though Lorelai has her life way more together at 35 than I could ever dream of. Although Thursday was not my actual birthday, it was actual Pizza Party Birthday night. We ordered four of the pizzas off the menu to share. First up, the Meat Loathers (A BBQ deluxe! 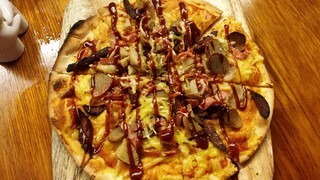 local 'Two Broke Guys' vegami, coal roasted sausage, facon, mock chicken and house-made smoky BBQ sauce). This was a popular favourite at the table, and was indeed delicious. It only needed some pineapple to make it perfect. 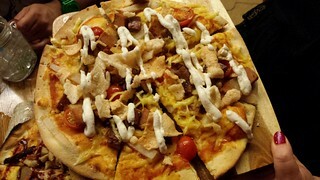 The Vegan Special of the fortnight was a Stroganoff Pizza. This was nice, though I expected it to be creamier. 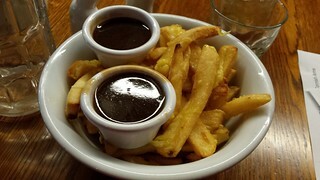 The sauce was more like gravy. I had also secretly hoped it would have actual pasta on it for extra carby goodness, but alas no. 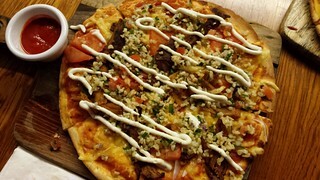 My favourite pizza was the Souvlaki Pizza (Spiced fried seitan, tomato & onion, garnished with chilli sauce, garlic sauce, & tabouleh), but we got the chilli sauce on the side to make it Susan friendly. This was just so nice and fresh, definitely welcome with all the richer food on the table. The final pizza was the Vegan Porchetta (Vegan pork belly, popcorn 'rib', cherry tomato, pear and red onion finished with crispy crackling and aioli). Unfortunately this was a bit of a flop with all of us. I think because of the pear in the description we were expecting a sweet undertone, instead this was just all fat and salt but not in a great way. The pear was barely noticed. We wouldn't get this again. Because Ashleigh is GF, none of the pizzas were suitable for her (they don't do GF pizza), so she ordered another vegan GF chicken burger. This one was very different from LotF one, more like fried chicken. She liked it, but not as much as the LotF one. The next morning we were planning on having breakfast at a nearby cafe that had several green things on the menu. But alas, they were unexpectedly closed! 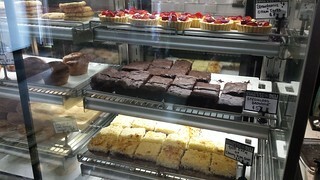 Thankfully Smith & Deli was just down the road, and was our next spot to visit anyway. 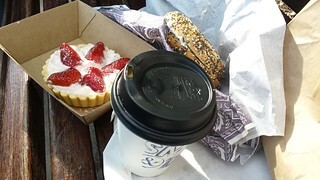 I got one of their delicious chai lattes, and everything bagel with dill cream cheese, and a strawberries and cream tart. So, let's talk about this tart. At first I assumed it would be coconut based and would probably make me sick, but when I asked I was told that there was no coconut even in it. And I am so happy, because this is the best thing ever. I almost cried when I ate it. I just loved it so much, it was perfection. 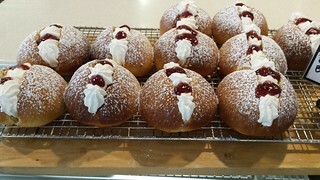 The strawberry cream filling was light and not too sweet and perfection. I weep just thinking about it. Smith & Deli was also our lunch stop, and I met up with my friend Leigh. 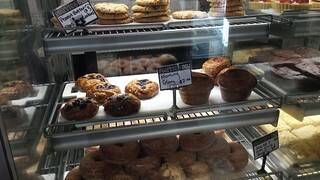 First up, let's take a tour of their bakery cases! For lunch, I had to get another Straberry and Cream tart! 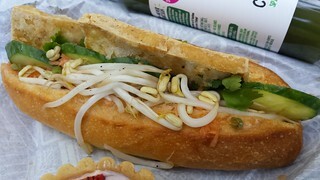 I also got the Anaphylaxis of Evil sandwich (satay tofu, bean sprouts, picked daikon and carrot, cucumber, fresh chili, coriander on a roll), but I got them to leave off the chili. This was so good and fresh and delicious! 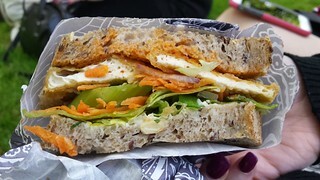 I think maybe my favourite sandwich from there to date. And I also got a green juice. Leigh got the Hail Seitan (salami, ham, turkey, pineapple, BBQ sauce, which I is definitely on my list of things sandwiches to try! And Ashleigh got Buffalo the Vampire Slayer (buffalo tofu, ranch, shredded iceberg, carrot, red onion and celery) made gluten free. I love the name of this sandwich so much, Buffy being my favourite show ever, but it is too spicy for me. 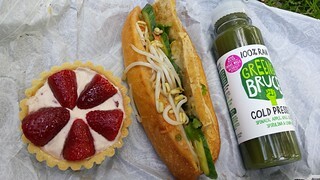 After saying goodbye to Leigh, Ashleigh and I went for a walk down Gertrude St to Smith St to check out the shops and vegan offerings. It was really hot. 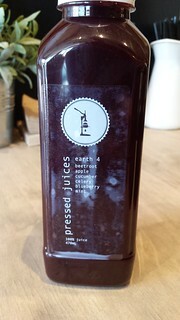 I stopped into Pressed Juices to pick up a silly but refreshing beverage. 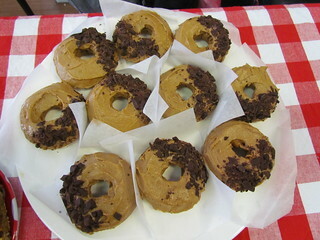 We also stopped into Donut Shop Fitzroy, Fatto a Mano and Friends of the Earth. I didn't get anything from Donut Shop (they had two flavours of vegan glazed doughnut, but they didn't grab me), I picked up some treats from the other places that I will share later. We ran into this friendly and sleepy shop kitty in a vintage shop! 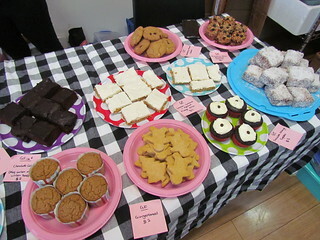 Over the weekend I organised another bake sale for Animal Liberation QLD. Once again it was held at the wonderful The Green Edge. Buckle in, because there are a lot of photos! 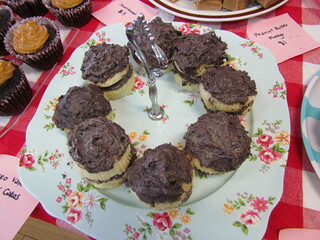 First up, the new things that I made for the bake sale. 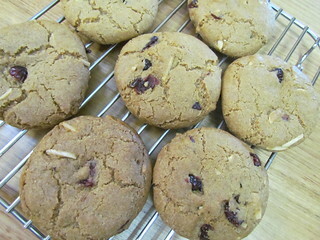 Cranberry and Almond Cookies: This is actually the Soulhaus cookies I make all the time from Great Gluten Free Vegan Eats by Allyson Kramer, but as my chocolate chip stash was low I swapped them out for cranberries and almonds for yummy variation. 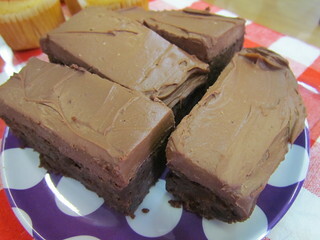 Chocolate Cherry Slice from Vegan Indulgence by Leigh Drew. 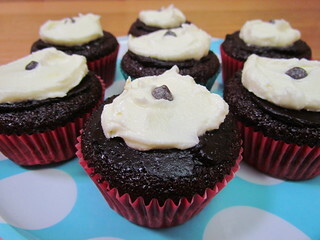 One of my favourite recipes ever, I love the chocolate cherry combination. Plus they are topped with a cream cheese based icing, so they are basically chocolate cherry cheesecake bars. 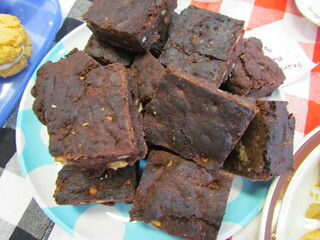 I have made this recipe before, but not for a while and not for a bake sale. 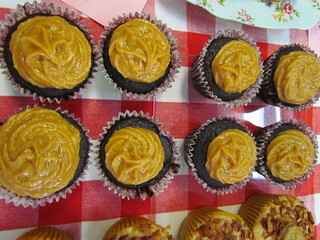 Chocolate Orange Gluten Freedom Cupcake are a variation I made from the chocolate GF cupcakes in Vegan Cupcakes Take Over The World by Isa Chandra Moskowitz and Terry Hope Romero. 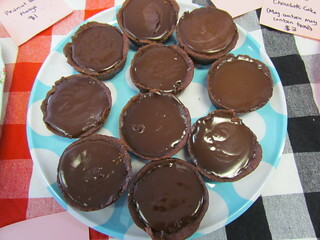 I added one and a half teaspoons of orange essence to the batter, which results in a very chocolate orange kind of taste. I glazed the top with some chocolate glaze (see below) and some leftover orange buttercream that I had hanging around in the freezer. 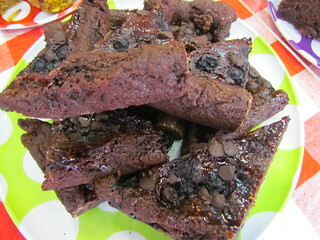 Chocolate Brownie Slice topped with Oh-So-Rich Chocolate Glaze from Naturally Lean by Allyson Kramer. The cake is an oil free cake, with banana and applesauce in the batter. I could taste the banana in the cake, but most other people couldn't. I liked the flavour, but I did find the cake a touch dry. But the glaze... oh, the glaze. 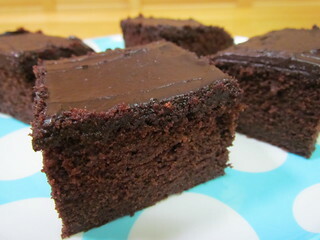 It is so quick, so simple, firms up so nicely, and is perfectly rich and chocolatey without being too sweet. I will be using this a lot, like when I made another batch to put on the cupcakes above. 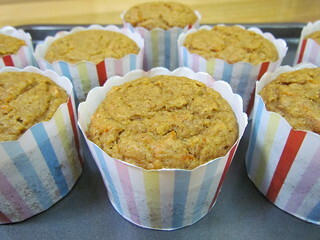 Carrot Applesauce Muffins from Naturally Lean by Allyson Kramer. These were OK, but a little bland. They were crying out for some sultanas and nuts to make it a bit more like a carrot cake. My muffin cases were quite large, so I got nine rather that 12, and baked them for 30 minutes rather than 25. 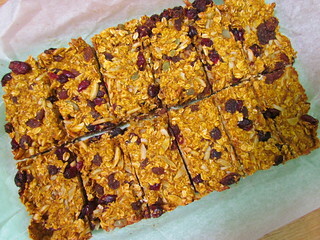 Nut and Fruit Granola Bars from Oatrageous Oatmeals by Kathy Hester. I really liked these. 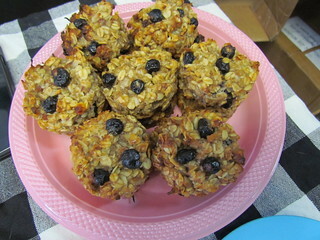 They are held together by tinned pumpkin and flaxseeds and are oil free, with oats and nuts and fruit mixed through. 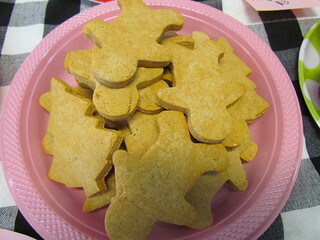 They are also sugar free, but I added a bit of maple syrup. I used a mix of cranberries, sultanas, almonds, walnuts and pepitas for my mix. 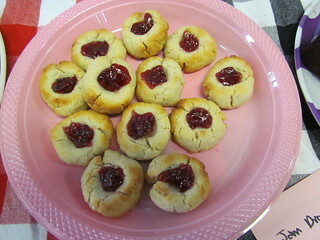 They are a bit gummy right after baking, but the texture improves with a day or two in the fridge. 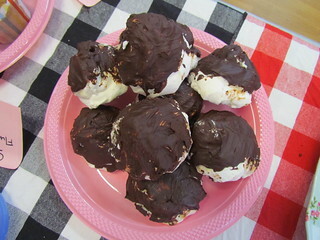 There were some of these left over, and they have made great snacks to have on hand. 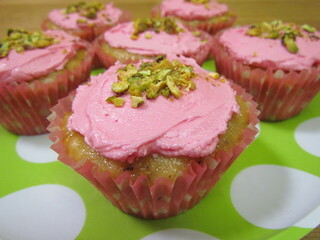 Pistachio Rosewater Cupcakes from Vegan Cupcakes Take Over The World by Isa Chandra Moskowitz and Terry Hope Romero. 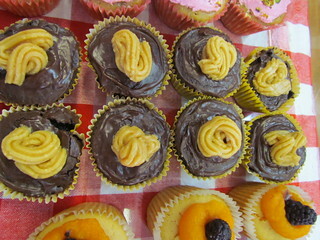 These re very sweet and delicate cupcakes. I love rosewater, so I used the full amount. The recipe calls for chopped pistachios, and talks about chopped nuts in the cupcakes in the description, but the instructions don't seem to mention adding the nuts, so I just stirred them through at the end before putting into the liners. These cupcakes rose quite nicely. The glaze ended up being more like an icing, quite thick. I tinted it pink as well for fun. The recipe calls for pink decorating sugar crystals, which I could never find, but I did get some pink sprinkles. But I didn't end up using them as I made the glaze quite pink. 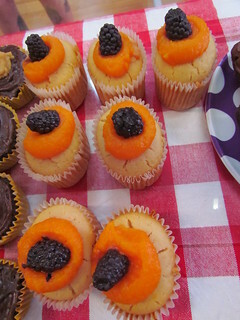 Elvis Cupcakes from The Superfun Times Vegan Holiday Cookbook by Isa Chandra Moskowitz. 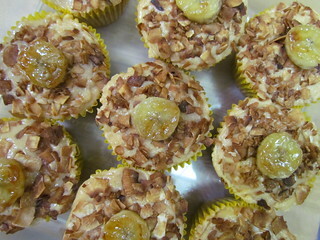 These are banana cupcakes with peanut butter frosting, coconut bacon and a caramelised banana slice. 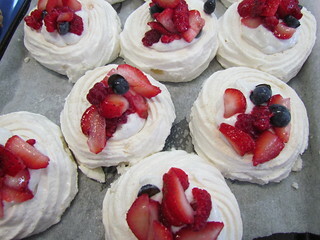 I will do a full write up of these when I get to doing my Superfun Times recipe round up. I changed the icing around so that I could leave out the coconut oil, so stay tuned for that. And of course I made some Berry Patch Brownies. And now, on to the other things that were there! 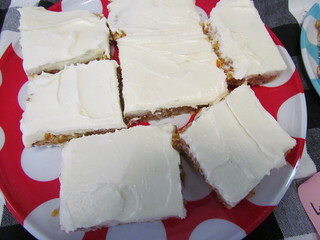 GF Lemon, Macadamia and Apricot Fudge Slice. 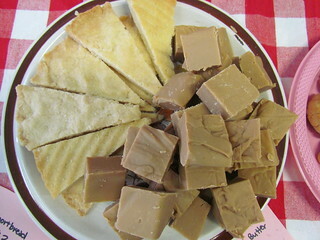 Shortbread and Peanut Butter Fudge. Lemon Curd Cupcakes. The lemon curd is based on sweet potato. I bought one of these and it was delicious! GF Fluffernutters. 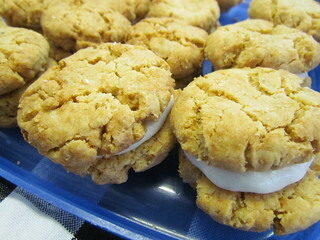 Peanut Butter Cookies with Marshmallow filling. 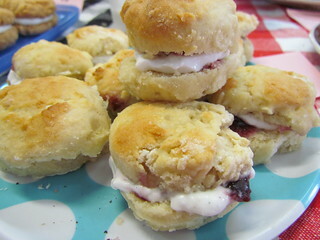 Mini Scones with Jam and Cream. 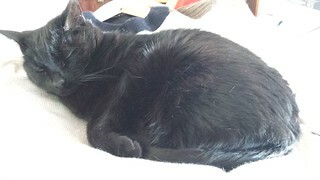 This little girl is called Shari Rose, and she is looking for her forever home! 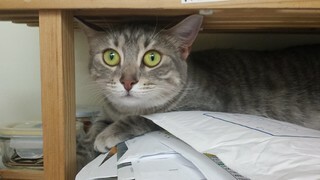 She is one of the adoption kitties at our Clayfield clinic. She is very cheeky and very cute, so if you are in the area and thinking about adopting a special friend, why not check her out? The first post-MoFo post! 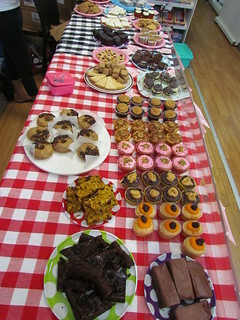 I needed a couple of days break from blogging, also because I organised another bake sale on the weekend and was doing a lot of prep for that. More on that in a future post. For now, time to get back to a regular blogging schedule. I love love love Gilmore Girls. I own all the DVDs, and have seen it several times. So when they announced a Gilmore Girls revival on Netflix, a special 'year in the life' series of four 90 minute episodes, I was so excited! The entire thing was released on Netflix a couple of weeks ago. Due to work, I couldn't watch it until two days later, which meant avoiding the internet to avoid spoilers. There won't be any spoilers here. Overall, I enjoyed it. I delighted in parts, some parts were weird, some parts were infuriating. But it was nice to be back in Stars Hollow. Of course, one of the most important parts of Gilmore Girls is the food. They eat so much of it, and of such a wide variety. I couldn't settle down to six hours of Gilmore Girls without planning some themed food. Really, so many things could be part of a Gilmore Girls-themed food spread, and I thoroughly enjoyed seeing all the different things everyone was eating in celebration. For me, when I think of Gilmore Girls I really think of American-style diner food, I guess because much of it is set at a diner, and packaged convenience foods. Though you could have picked almost any food theme and it could have applied! So I didn't start my day in a very Gilmore Girls' fashion. Instead of rolling out of bed for a poptart and a coffee (which I don't even drink), I went to a 90 minute bikram yoga class and then had a green smoothie. I am me, not them, after all. And it was important to get myself off to a good start to my day before the watching and eating began. Incidentally, this is how I start pretty much every Sunday. But onto the actual food! I had so many thoughts and plans, but ultimately had to streamline things down to make a doable lunch given that I couldn't do any prep in the days leading up to it due to work. Anyway, this is what we had! Mac and cheese was a must, because mac and cheese is always a must. I used the Daiya Cheddar Mac and Cheese. 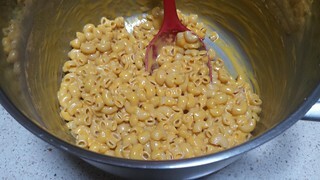 I thought it was OK, I liked that the sauce is much thicker than other boxed mac and cheeses. Of course, it doesn't life up to a homemade cashew mac and cheese sauce, and at $14 a packet here in Australia I won't be buying it much, but definitely the best boxed mac and cheese I've had. 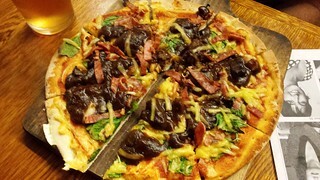 A BBQ Cheeseburger Pizza. Initially I was going to have burgers and pizza, but that was getting a bit too much. And then I was going to try and find the Gardein Beefy Sliders, but the one place I went to didn't have them and I didn't feel like traipsing all over Brisbane to see if I could find them. So I ended up merging the two. 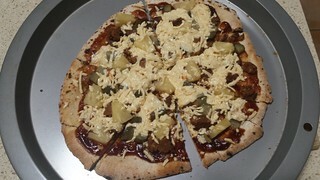 A purchased pizza base with smoky BBQ sauce, a chopped Gardein beefless patty (I don't like Gardein chicken-style things, but I enjoyed the beefy patty), pickles, pineapple (because I am me), and Daiya mozzarella. It was good! 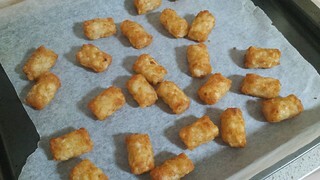 Potato Gems aka Tater Tots. This choice was almost immediately justified as they mention making tater tots in the first five minutes. And really, is it ever a choice when it comes to potato gems? It is kind of a given. I needed something fresh on the plate, so I cut up some celery and carrots. This is not very Gilmore Girls. 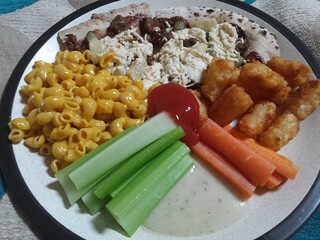 However, I attempted to salvage it by serving with some bottled Daiya Ranch Dressing. 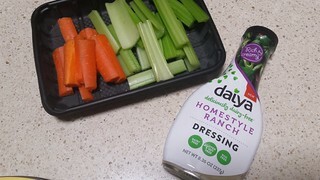 I love the Daiya Blue Cheese dressing, the Ranch I was not such a fan of. 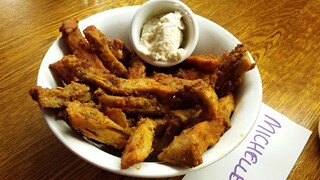 But then I prefer blue cheese dressing to ranch dressing in general. 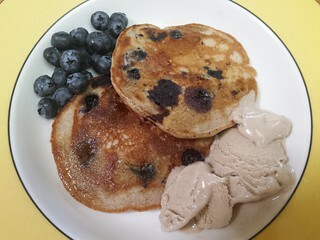 For after lunch dessert/afternoon tea, I made some Blueberry Buckwheat Pancakes from the new Isa Super Fun Times Cookbook. 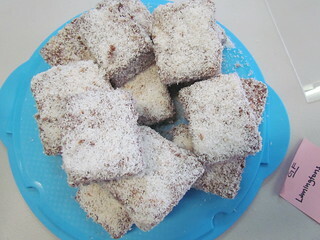 I will do a bigger write up on those when I do a recipe round up for the book, but they were good. And served with some more fresh berries, maple syrup, and So Delicious Cashew Snickerdoodle Ice Cream. Oh yes. If you are looking for a more in-depth breakdown of what happened in Gilmore Girls (after watching it yourself of course, because it is full of spoilers), I highly recommend checking out Laughfrodesiac, for Randi's hilarious take on everything. She has done Winter and Spring so far, with the other two seasons to come! Did you watch Gilmore Girls? This is an older photo, but still a favourite of mine. I introduced you to all the cats of my life over the days of MoFo. 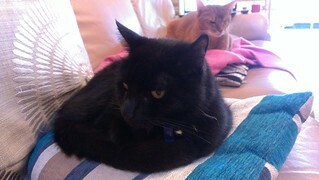 Of course Dim Sim and Sahara are still the current cats in my life... which they must be forever (we've struck a deal).